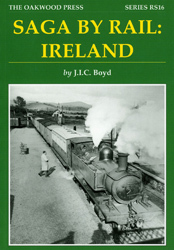 James Boyd’s love of Irish railways began in the 1930s. These are his reminiscences of his visits. He concentrated his attention on the narrow gauge railway systems, but did not neglect the main 5 ft 3 in. lines which he came across. Little of the subject matter of this book can be experienced today; accordingly, these accounts have taken on a historical significance. As time has gone by his knowledge of those early subjects has been enhanced by later fact-finding – this extra material has been incorporated into the text to give it more substance. Readers who expect to find some gems of research herein will be disappointed but to counter this there will be others who will read this with a certain amount of envy. A5 format, 288 pages, 295 illustrations.